MONTEVALLO, Alabama — Efforts by educators at Montevallo Elementary School to identify and help treat dyslexia in students earned them an award this week for their ongoing work. 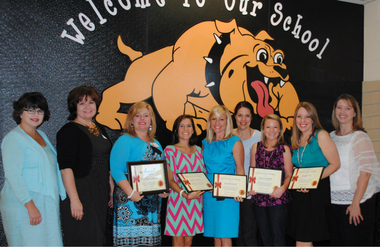 The Decoding Dyslexia–ALA group consisting of parents of dyslexic children presented the awards at the school Tuesday to Montevallo Elementary Principal Allison Campbell, literacy coach Meredith Smith and teachers Jennifer Nix, Andrea McCary, Shonda Chadwick and Jenna Campbell. The award recognizes their work and training in Orton-Gillingham reading programs that help them to be able to identify and support dyslexic children in schools. According to information provided by Decoding Dyslexia–ALA, the Orton-Gillingham approach uses one-on-one teacher-to-student instruction or small group settings in a multisensory and systematic program. The training provided the participants with education on effective teaching strategies for students with reading, writing and spelling difficulties associated with dyslexia, according to the group. Most of the Montevallo teachers received the training in April and have started to use it in their classrooms. The state group is part of the Decoding Dyslexia–USA movement involving more than 20 states. For more information about the group’s work, find Decoding Dyslexia–ALA on Facebook or send an e-mail to decodingdyslexiaala@gmail.com. The 1in5 Initiative PSA – :60 TV spot from The 1in5 Initiative on Vimeo.